No self-respecting man’s closet is complete without a good blue, black and grey suit. When you invest in a high-quality custom-made suit, you want to be able to get some wear out of it, right? The next weeks we’ll give you some tips on how to do just that! The key to wearing your suit on more occasions than going to the office is seeing it as 2 individual pieces of clothing. Not just a 2-piece suit that has to be worn together all the time, but a separate jacket and pair of pants you can combine with the rest of your closet. Let’s start with the obvious way to wear your basic grey suit: with a white shirt and tie. Adding a tie to your work outfit tells your colleagues and customers you mean business. When you look professional people see you as professional. You might think that an open collar without tie gives off a more relaxed vibe, but it only makes you look unfinished. Like you rushed out of the door and forgot something. If you choose to wear a suit with white (or blue) shirt for the office, you should always finish the look with a tie. 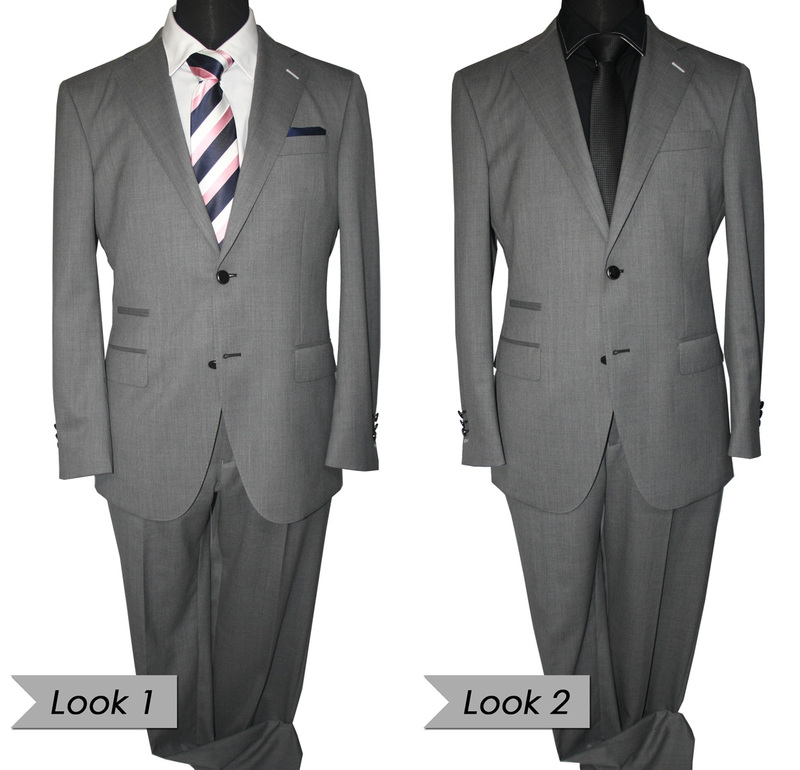 Fast forward a few hours and your business suit easily transforms into a slick night version. Just replace your white shirt and colored tie with a black shirt and a black tie and you’re ready for a night on the town. Next week we’ll show you two more relaxed looks that you can create with the same basic grey suit. Are you ready to take the next step towards your bespoke suit? Set up your no-strings-attached introduction appointment and get $75 dollars discount on your first SF Tailors suit! With our 2 piece fully custom made suits starting at just $599, you could get yours for as low as $524! Click here to book your appointment now!